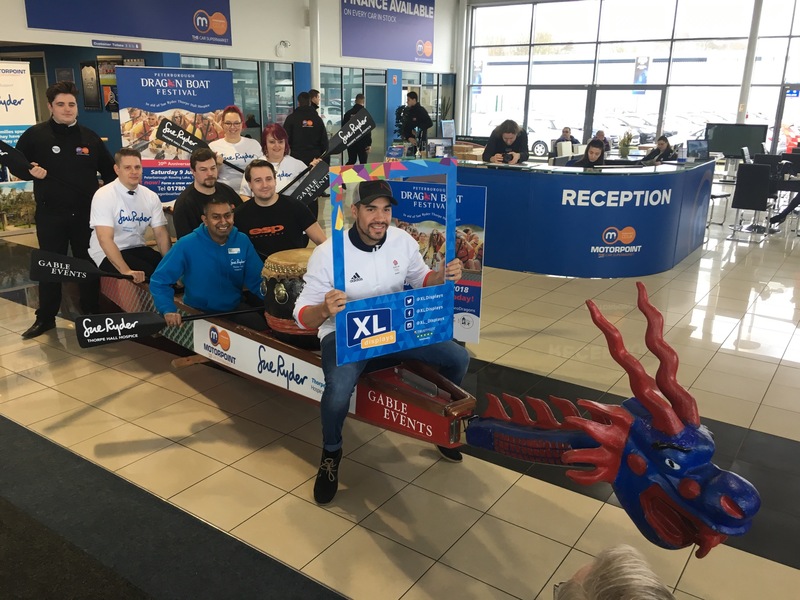 On Friday 26th January, XL Displays attended Motorpoint Peterborough’s launch day for the 20th Peterborough Dragon Boat Festival, where we announced that we will be participating with 2 teams as part of our yearly fundraising efforts. The event will take place on June 9th 2018 at Peterborough Rowing Club. The event is organised by Gable Events and is sponsored by Motorpoint Peterborough. Connect FM and ESP Magazine are the media partners this year and for the 4th year running, Sue Ryder Thorpe Hall Hospice is the charity partner. All partners attended the launch day at Motorpoint Peterborough and was a great opportunity for us to meet everyone involved in the event and gain an understanding of what we can expect from our first year participating in Peterborough Dragon Boat Festival. The dragon boat festival is one of its kind with a projected 50 teams to take part and battle it out this year, all fundraising money for Sue Ryder’s local hospice, Thorpe Hall Hospice. The hospice delivers an array of care not only at the hospice itself but across the region through its Hospice at Home, Bedfriending and family support services. To continue to provide this care the team at Thorpe Hall Hospice have to raise £2.3million this year. Sue Ryder are hoping to raise £20,000 through the 20th Peterborough Dragon Boat Festival so staff and volunteers can continue to give more families the time, memories and care they need at the most difficult times. Sue Ryder Thorpe Hall Hospice is a cause that we have continually supported over the last year having raised over £2,100 to date. Numerous staff members have personal connections to this great local cause and having visited the Hospice, we are proud to support such a tremendous cause through participating in another big event this year. Dragon boat racing is an ancient Chinese tradition and one of the fastest growing water activities in Britain today. The race will see each team have 10 people paddle a 30’ dragon boat with a drummer at the front beating time and a helm at the tail steering a straight course. To announce our participation in this great event, XL Displays attended Motorpoint Peterborough’s official launch day on Friday 26th January. Local Olympic Gymnast and Gold Medallist, Louis Smith, attended the launch day to show his support for this renowned local yearly event. We were lucky enough to interview Louis Smith himself and get his take on what it means to be involved in the Dragon Boat Festival, whether he will be participating and what tips he has for our staff members taking part. The full interview is available for veiwing on our Social Media pages including Facebook. Also attending the launch day was Nilesh Patel, community fundraiser for Sue Ryder Thorpe Hall Hospice. Our Marketing Manager Lisa Hall interviewed Nilesh to get an insight into what the event means to Sue Ryder Thorpe Hall and what we can expect to see from the day. This video too is available for viewing on our social media pages like Facebook. As a very competitive business, we are turning up the heat and have created an 8 week training plan for all staff members participating. We see the fitness and well-being of our staff member as a top priority so want to ensure they are fully prepared to participate in the Dragon Boat Festival and perform their very best. We are making a pledge to all local businesses to take on the challenge and see if they can beat our 2 teams – The Naughty Oars (Women’s Team) and The Anchor Buoys (Men’s Team). If you think you can beat our teams, contact Gable Events or Sue Ryder Thorpe Hall Hospice and register to take us on and raise money for a truly great cause! We thoroughly enjoyed attending the launch day at Motorpoint Peterborough and we were proud to announce our participation in such a great local event. For exclusive pictures and behind the scenes footage of our time at the launch day, visit our Facebook, Twitter or Instagram pages. XL Displays will also be attending the launch day organised by Gable Events and Sue Ryder at Serpentine Green Shopping Centre on 17th February. Pop along and say hello to the team and get involved in this superb event! If you’re in the area on June 9th 2018, be sure to come along to Peterborough Rowing Club at Thorpe Meadows PE3 6LN. Come and show your support and enjoy a fabulous day packed with plenty of bankside family entertainment including funfair activities, inflatables and children’s rides plus a variety of food stalls and bar.